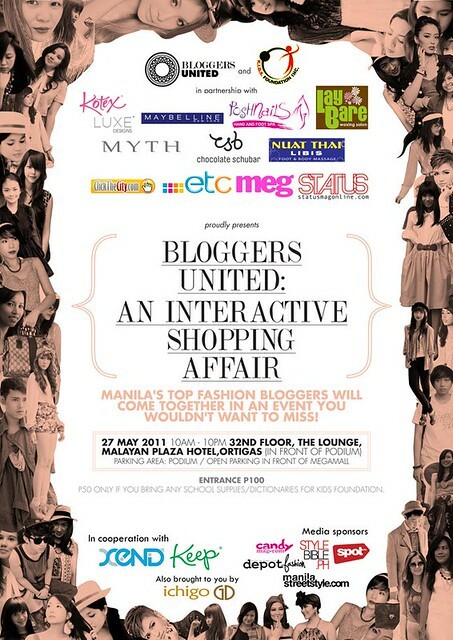 Manila's top fashion bloggers will come together in an event you wouldn't want to miss! I will be selling some brand new items, as well as pre-loved goodies from my closet. I'm sharing a booth with none other than Kryz Uy of Thirstythought! Riz and I are performing during this event, too! The Bloggers United is a team dedicated to delivering breakthroughs in the metro’s blogging community. We are in an effort to pool bloggers and really turn it into a “community”. We recognize the bloggers’ massive power to inspire, and influence the public on how they think, behave and spend. But more than that, we want to use that power in order to make an action in spreading social awareness and issues to our fellowmen. The team brings you the 1st-ever Bloggers Bazaar featuring Manila's top and most influential fashion bloggers selling their personal closet items and selected pieces from their respective brands. Our aim is to create a venue where inspiring bloggers and their readers can personally come together and interact with each other. It will also serve as a networking site as we invite bloggers and readers from different categories and a couple of friends from the press and media. The most important part of this event is that, it is a tie-up project with KIDS FOUNDATION and certain sponsorship proceeds will be donated to charity.